Insects are able to use skymarks such as the sun and the pattern of polarized light as a celestial compass. This compass is part of a dead-reckoning (vector navigation) system, by which the insect takes record of all translatory and rotatory movements during its foray and continuously computes the mean vector pointing from the start to its actual position (Figs. 5-7). This paper deals mainly with two aspects of the insect's celestial compass. First, it describes how the pattern of polarized light present in the daytime sky can be mapped on to the two-dimensional array of photoreceptors within the insect's eye and what neural response patterns result when certain sets of photoreceptors and second-order interneurons view the sky. Second, it tries to elucidate the strategy which the insect applies in reading compass information from the sky. Whereas the former approach is mainly based on optical, neuroanatomical and neurophysiological studies, the latter heavily draws on behavioural work. Most of both neurobiological and behavioural investigations have been performed in the long-legged, fast-running desert ants belonging to the genus Cataglyphis (Figs. 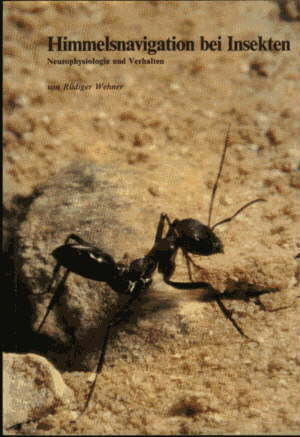 3, 17a, 19 and cover; for a short characterization of Cataglyphis ants see p. 15). 1. Skylight patterns, receptor arrays and neural images. a) Skylight patterns result from the scattering of unpolarized light of the sun within the earth's atmosphere. These patterns include variations of intensity (I), degree of polarization (D), and angle of polarization (c) as well as how all these variables depend on the wavelength of light (l (Figs. 12-15, Plate 1). b) The celestial system of coordinates is mapped on to the compound eyes of Cataglyphis (Fig. 23). This is accomplished by (1) exploiting the optical phenomenon of the luminous pseudopupil (Plate 2) in order to determine the directions of view of individual ommatidia, and (2) measuring the angle of pitch and roll by which the ant's head is adjusted relative to the transverse and longitudinal body axis, respectively (Figs. 19 and 53). As during navigation both angles are kept rather constant, it is only when the ant changes its compass bearing, i.e. rotates about its dorsoventral body axis, that the celestial coordinates move across the eye. In addition, by referring to the directions of view of the marginal ommatidia of both eyes, the range of binocular overlap as well as the area covered by neither eye are calculated (Fig. 21; for maps exhibiting the density of photoreceptors see Fig. 24). c) The anatomical organization of the retina is described for both the worker honeybee (Figs. 29, 30, 31 a~) and the ant Cataglyphis (Figs. 31 d-f, 33, 34, 36, 3941). Special emphasis is placed on structural differences as they occur among the retinulae of different parts of the eye (Figs. 31 and 37). The specialized ommatidia present in the dorsal rim area of the eye are characterized by (1) relatively large rhabdoms, (2) an orthogonal arrangement of microvillar directions within the rhabdom, and (3) a fan-like arrangement of the transverse axes of the rhabdoms within the retina (Fig. 32). (4) The dorsal rim area looks contralaterally (Fig. 35). In addition, the retinulae of the dorsal rim area of Apis (5) consist of nine long photoreceptor cells that are (6) not twisted (Fig. 29) and (7) characterized by large visual fields (Fig. 28). The latter property is due to structural specializations within the overlying corneal lenses (Fig. 27). In the remainder of the bee's eye the retinulae are twisted (Fig. 29) and comprised of one short and eight long photoreceptor cells. d) The spectral sensitivity functions of the ultraviolet and green receptors are determined for both ants and bees (Fig. 25). Untwisted ultraviolet receptors exhibit high polarizational sensitivity (5 < PS < 10), whereas the twisted long ultraviolet receptors of the bee's retina are insensitive to polarized light (PS < 2). e) In both bees and ants green and ultraviolet receptors give rise to short and long visual fibres terminating in the lamina and the medulla, respectively. Different structural types of second order interneurons (monopolar cells) are described (Fig. 41). f) Neural response patterns (neural images) are designed which result when an array of polarizationally sensitive opponent cells (P- [polaroticity-] interneurons) views the pattern of polarized light in the sky (Fig. 42, Plates 3 and 4). 2. Properties of the celestial compass. a) In the visual systems of bees and ants the detection of polarized skylight is exclusively mediated by the ultraviolet receptors (Figs. 44 and 47). In contrast, the unpolarized light of the sun can be used as a compass cue when only the green receptors are stimulated (Figs. 4547). As light from the radiant sky is rich in ultraviolet but light reflected from the surface of the earth is not (Plate 5), it seems likely that the ultraviolet receptors have evolved in the functional context of skylight navigation. It might have been only later (e.g. in coevolutionary interaction with the development of ultraviolet floral patterns of angiosperm plants) that they became incorporated into a colour vision system used in the detection of terrestrial objects. b) What different parts of the eye contribute to skylight navigation is studied by occluding specific parts of the eye with paint (Figs. 48 and 54) or screening off certain parts of the sky (Figs. 9, 11 and 53). The results are summarized in Figs. 49 and 50 for Cataglyphis and Figs. 55 and 56 for Apis. The dorsal rim area (see Sect. lc) is of special importance for the detection of polarized skylight. c) Ants are informed rather well about the daily movement of the sun's azimuth, i.e. the symmetry line of the skylight patterns (Fig. 57). However, they slightly underestimate the highest rates of movement of the sun's azimuth at noon and overestimate lower ones (Fig. 58). This is consistent with the hypothesis that some kind of interpolation procedure contributes to the ant's internal representation of the movement of the sun. When tested at night, the ants interpret the moon as the sun (Fig. 59). d) How does the insect derive compass information from skylight patterns? (1) The insect could use some knowledge about the physics of Rayleigh scattering and deduce the position of the sun as the intersection point of at least two great circles running at right angles to the e-vector directions measured in at least two points in the sky. (2) The insect could be informed about the distribution of e-vector directions across the sky, i.e. rely on an e-vector map. In both cases the insect should exhibit a certain type of ambiguous (bimodal) orientation when confronted with a single point in the sky (Fig. 60). This never occurs in either ants or bees. When a horizontal e-vector is presented, the insect orients correctly by interpreting the horizontal e-vector as being positioned along the antisolar meridian. However, when e-vectors are offered that are oriented in other than horizontal directions, small but consistent errors occur. Apparently, insects rely on some generalized version of the e-vector pattern in the sky. If this holds true as a general strategy (even when the insect is able to view large parts of the sky), the next question can be phrased as follows: How are the insect's peripheral neural images such as the ones shown in Plates 3 and 4 transformed to more central neural images which the navigating insect must compare continuously with its internal (generalized) master image of the sky? In addition to polarizational cues, insects refer to spectral cues in the sky. e) The possible mechanisms of celestial and terrestrial navigation (Figs. 61-63) are compared briefly. In both cases insects do not seem to rely on three-dimensional representations of their visual surround (i.e. the celestial hemisphere or the arrangement of terrestrial objects around the insect), but on the analysis of two-dimensional images and sequences of such images.